It may well be objected that my attempt to judge the Orthodox Study Bible by its cover was a rather superficial exercise. I'm quite willing to grant this, and will attempt to remedy this in this and subsequent posts. I have, in fact, since opened the OSB and discovered, much to my surprise, that the dust jacket does not in fact do the OSB justice. It is, in fact, much worse than advertised. The cover promises the reader that the OSB will allow him to "become more conversant about [sic] the ancient roots of Christianity" while expanding his "Bible knowledge with commentary from Christian teachers of the first millennium." While the Orthodox reader may wonder about this fetish for antiquity as the source of true doctrine, it's still not a bad set of promises. The OSB contains, in its opening pages, a list of source abbreviations. One can see at once that things are off to a bad start. Although the cover makes repeated promise to limit sources to "Christian teachers of the first millennium," one finds St Gregory Palamas and St Seraphim of Sarov listed among the authors cited. While they, of course, are welcome, they lived well after the editors' self-imposed cut-off date: St Gregory reposed in the fourteenth century and St Seraphim in the nineteenth. Even odder is the fact that, although listed, St Seraphim is, in fact, nowhere cited in the entire volume. One then notices the inclusion of Theodore of Mopsuestia and Thordoret, both of whom were condemned as Nestorians at the Fifth Ecumenical Council. These are not the sort of "ancient roots" one should be looking for. The identity of certain of the listed authorities is also confusing. One can safely assume that Eusebius is that of Caesarea, but he could likewise be Eusebius of Nicodemia or Samosota. Or who is "Nicetas"? Probably St Niceta of Remesiana, but possibly also Nicetas Acominatos or Nicetas Stethatos. In order to answer these questions one looks for the bibliography to find which works are being cited. But there is no bibliography! One simply has no way of following up any of the citations. What then, really, is the point? Where and how can one, for instance, look up an interesting quotation from St Maximus the Confessor? On to the Patristic commentary itself. There is extremely little of it. The vast majority of study notes do not come from the Fathers at all; more often than not, they simply give a sort of play-by-play of the Biblical text, like notes in a junior reader edition of Hamlet. One can turn page after page after page without finding a single mention of the Fathers and, when one does chance upon one, it is normally a very brief paraphrase rather than a direct quotation. Moreover, whatever quoted passages from the Fathers are to be found are rarely more than a single sentence long. Now, it is understandable that Patristic commentary on, say, the Book of Nehemiah may be scarce. But what is really shocking is to see the almost complete absence of Patristic commentary on the Gospels, apart from a very occasional reference to St John Chrysostom. This simply boggles the mind. Given the questionable authority of a number of the "Fathers" cited as sources, the scarce number of study notes in which the Fathers are cited (let alone quoted) at all, the almost complete absence of Patristic commentary on the New Testament, and the complete and utter absence of a bibliography or any other other sort of key by which one could trace passages back to their sources, I simply can't see how the editors of the OSB could, in good conscience, claim that they are bringing "to one volume the words of Scripture and the understanding of those words from the earliest days of the Christian era," unless they feel that they can express that understanding better than the primary sources themselves. In subsequent posts I hope to comment on the OSB's disastrous Trinitarian theology and its entirely Protestant approach to the study and authority of Holy Scripture. If my comments seem harsh it is because the OSB could have been better, and should have been better. As I've mentioned before, if the OSB had managed to package an Orthodox approach to Scripture within the limits of a Protestant-style study bible, I'd be much more gentle in my criticism. That the OSB should prove to be so deeply foreign not only to the ethos of Orthodox Christianity, but to its doctrine and teaching as well is simply unforgivable. I must confess that the study notes to Proverbs are about as redundant (and just down right silly) as any you will come across. Having to explain (and poorly, at that) the Proverbs defeats the whole purpose of their literary genre. I'm not supposed to get angry while reading Scripture before morning prayers! Not a good way to start each day! Perhaps the icing on the cake of absurdity is the prohibitive pricing of the book! I'm definitely not wasting my money. Thanks for your insights-- can't wait to read more. Many of your points here are well taken. I do take issue with your objection about Theodore of Mopsuestia and Theodoret. Certainly, these folks are not strictly Fathers of the Church, but they may have had some interesting and useful things to say ... even some Orthodox things to say (! ), despite the fact that they also advanced Nestorian ideas, which they were rightfully censured for (ideas which, I would imagine, even the OSB editors would have the sense not to include in the OSB commentary). I feel the same way about post-schism Western theologians such as Bernard, Bonaventure, or Thomas Aquinas. No, they don't have a very exalted place in the Orthodox Church, and there are aspects of their thought which are not recognized in the Orthodox Church, but that doesn't mean they didn't have anything helpful or true to say. bja, one simply cannot call writers explicitly named heretical in synod "Church Fathers," no matter what may be the value of their individual sayings. Seeing the poor judgment in the rest of the volume, are we really to understand that such have been appropriately vetted? In addition, is it not the case that in finding such names listed among the Fathers, the uninformed layman will simply assume that the OSB is correct in including them there, and perhaps look up their works and read them without any inkling as to the potentially deleterious spiritual effects? This is badly done, badly, badly done indeed. This is true scandal, a stumbling-block for the faithful. "On to the Patristic commentary itself. There is extremely little of it. The vast majority of study notes do not come from the Fathers at all; more often than not, they simply give a sort of play-by-play of the Biblical text, like notes in a junior reader edition of Hamlet." That was my impression, too. EXTREMELY disappointing lack of real "comments" from the Fathers. A sentence here, a phrase there. And, like you say, no references so one can look up the quote in the source and read it in context. My old NIV Study Bible has more and better notes, even though they are at a very elementary level. The Jewish Study Bible (using the NJPS translation) does much, much better. 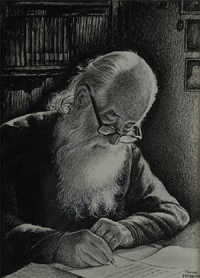 Or take a look at the one-man job of the late Rabbi Aryeh Kaplan, THE LIVING TORAH (Hebrew and English edition), if you get a chance or can find one. It includes a listing in the back of names, dates, major works, etc., of all the Talmudic and Rabbinic authorities who are quoted or referenced in the notes. I agree that these Nestorian figures should not be called "Church Fathers." And I agree that the OSB editors' language is extremely sloppy. I've not seen exactly what they've done with the two Nestorian writers in question, but my point is that I'm not offended at their inclusion as long as they have something helpful to say which isn't contrary to the Faith. Again, I don't know what the editors did with them, but I would be very shocked indeed if they included blatantly Nestorian interpretations. I admit that I have not examined the OSB very closely (so I will bow out of the conversation until I've had a chance). My initial impression, based on my own brief perusal and the testimony of others, is that it's sloppy and questionable in some areas. But do you really think that it is so disasterous that it will destroy the Faith of Orthodox Christians ("true scandal, a stumbling-block for the faithful")? If so, then the Bishops of all jurisdictions should be forbidding it to be sold in their churches or used by their faithful. Joseph: I dread even looking at the notes for Proverbs; I can only imagine how jejune they are. A point I'll make in subsequent posts is that one simply can't give an exclusive explanation of any verse of Scripture, that the Fathers' reading of Scripture, which is always multi-layered, has nothing to do with the sort of silly and redundant approach you mention. And, yes, I, too, have to take a deep, deep breath before even looking at the OSB. Zac: The price really is outrageous, and unjustifiable. I'm glad to have saved you the expense. BJA: I agree with you, generally speaking, that the value of a given thought lies in its truth, not in its authorship. The OSB proves, if nothing else, that simply having the word "Orthodox" on the cover means nothing. But here it's a question of genre, purpose, and audience. The OSB, for better or for worse, is intended for catechetical purposes and therefore should have taken much greater care to cite figures whose writings are authoritative, not merely interesting and useful. I really like the Ancient Christian Commentary series, which includes authors who are not Fathers of the Church, but the ACC is of quite a different genre, and is quite honest about what it's doing (see the intro to the first volume in particular). I agree with Kevin's point, and think that BJA, in the last two paragraphs of his second comment, is greatly exaggerating and overstating Kevin's points. Jacob: thanks for your suggestions. The second work you mention looks especially valuable. All in all, the OSB is simply sloppy. I don't get the feeling that any single editor went through the entire volume with any care. Actually, while Theodore of Mopsuestia was condemned as a heretic at the 3rd and 5th Ecumenical Councils, Theodoret was not -- though some of his specific statements were condemned. In the case of Theodore of Mopsuestia, they seem to be following a tendency I have noted in stuff from St. Vladimir Seminary, in which he is held up as a great exegete. And while what he says may be of some interest, it certainly should not be cited as patristic commentary. I also agree that where the Fathers are cited, some reference to where the quote can be found should be provided so that these notes would serve as a means of plugging the readers into the fathers, rather than as a substitute for that. As for St. Seraphim, I thought I saw a footnote in which he was cited when I was flipping through a copy someone in my parish had gotten. As for the notes in the Gospels, I suspect that if there is less patristic commentary there, it is probably due to them not re-working the original notes from the previous edition as thoroughly as they should have. I would hope that they will have some standing committee that will make corrections to the translation as well as to the footnotes over time based on the feedback that they are getting. However, in my opinion, the primary utility of this text is the text of scripture itself, and contrary to the opinions of some, I think this text is at the very least a big step in the right direction... and as long as it is no worse than the NKJV, it cant't be too far wrong. On Theodoret, it's not sufficient simply to state that "specific statements of his were condemned." He was anathematized as a Nestorian at the Fifth Ecumenical Council. Moreover, if the "specific statements" you have in mind are the "Three Chapters," then these were, to say the least, a pretty big deal. Theodore has certainly undergone an academic rehabilitation, being held up as an example of the Antiochene school of exegesis. This is certainly not limited to SVS. The problem here, I think, is that the OSB simply doesn't make any attempt to convey the meaning of the Fathers' authority. They are, to the OSB, simply examples of Christian teachers of antiquity, not Holy Fathers. This is nothing new, really -- more a continuation of the old fib of the "Patristic period" than anything, but has no place in an Orthodox Bible. St Seraphim is nowhere to be found in the index, which is otherwise quite complete. As for the lack of Patrisitc commentary on the Gospels, I suspect you're right. The editors essentially pasted the OSB-NT into the new book, with maybe a few changes here and there. Personally, I think the last thing the OSB needs is a committee. The OSB is a prime example of too many cooks at work. What the OSB really needs is one single firm editor. I do take exception to your last lines. If the OSB simply advertised itself as an expanded and corrected NKJV, I'd likely welcome it. But the OSB claims to be much, much more than this. And, as I'll demonstrate, the notes and articles are often simply destructive. You wrote: "On Theodoret, it's not sufficient simply to state that "specific statements of his were condemned." He was anathematized as a Nestorian at the Fifth Ecumenical Council. Moreover, if the "specific statements" you have in mind are the "Three Chapters," then these were, to say the least, a pretty big deal." I am talking about the three chapters. And if you look at the sentence of the Fifth Ecumenical Council you will see that while Theodore of Mopsuestia was anathematized personal, it was only the writings of Theodoret against St. Cyril which were condemned -- not him personally, or all his writings. It also states that he renounced those writings at the Council of Chalcedon. 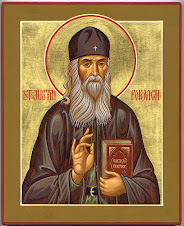 FC: "St Seraphim is nowhere to be found in the index, which is otherwise quite complete." I could be remembering wrong, but I thought I saw him cited in at least one note. FC: "Personally, I think the last thing the OSB needs is a committee. The OSB is a prime example of too many cooks at work. What the OSB really needs is one single firm editor." You need a chief editor, but you a translation committee is how most other modern translations have worked on correcting and improving the text over time. I suppose if you had the right chief editor, a single hand might work, but a single hand often results in certain quirky idiosyncratism that a good committee is able to weed out. FC: "I do take exception to your last lines. If the OSB simply advertised itself as an expanded and corrected NKJV, I'd likely welcome it. But the OSB claims to be much, much more than this. And, as I'll demonstrate, the notes and articles are often simply destructive." Me: I realize the goal of the OSB is more expansive, and I think the goals are fine. If they failed to meet them all, however, I think the text of Scripture is still the primary purpose of the book. The notes would have to be pretty bad to be worse than what we had before this was published... which is nothing... or texts like the RSV or the NRSV. "Moreover we condemn and anathematize, together with all the other heretics who have been condemned and anathematized by the before-mentioned four holy Synods, and by the holy Catholic and Apostolic Church, Theodore who was Bishop of Mopsuestia, and his impious writings, and also those things which Theodoret impiously wrote against the right faith, and against the Twelve Chapters of the holy Cyril, and against the first Synod of Ephesus, and also those which he wrote in defence of Theodore and Nestorius." I don't see how the Council's wording can be construed to mean that Theodoret was somehow anathematized and condemned to a lesser degree than Theodore. If anything, the Council's judgment may have come down particularly hard on Theodore because he was viewed as being one of the ring-leaders of the heresy (note how he and Nestorius are often mentioned in a single breath). (3) to claim that Theodoret's other writings were not condemned is an argument from silence. Does the Council anywhere explicitly endorse any of Theodoret's writing? Nonetheless, however we slice it, both Theodore and Theodoret (or, if you insist, some of the latter's writings) were condemned and anathematized by the Fifth Ecumenical Council. There is simply no excuse for them to be listed as authorities in the OSB. The reason I feel the OSB could have benefited from a stronger central editor does not have to do with the translation per se, but by the general sloppiness of presentation. Someone should have gone through to make sure that everything fit together. "The notes would have to be pretty bad to be worse than what we had before this was published... which is nothing... or texts like the RSV or the NRSV." NOTHING?! I just don't get that. 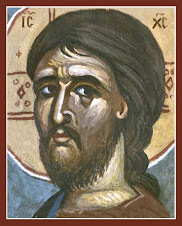 "Moreover we condemn and anathematize, together with all the other heretics who have been condemned and anathematized by the before-mentioned four holy Synods, and by the holy Catholic and Apostolic Church, Theodore who was Bishop of Mopsuestia, and his impious writings..."
Theodore of Mopsuestia is unequivocally called a heretic, and both he and his writings are anathematized. "..and also those things which Theodoret impiously wrote against the right faith, and against the Twelve Chapters of the holy Cyril, and against the first Synod of Ephesus, and also those which he wrote in defence of Theodore and Nestorius." This condemnation is very specifically directed at specific things Theodoret wrote. He is not called a heretic, and he is not anathematized personally. He renounced these writings himself at the 4th Ecumenical Council. The idea that Origen and Theodore were personally condemned, but not Theodoret is not something I came up with on my own. You will find that in just about any account of the 5th Ecumenical Council. "The notes would have to be pretty bad to be worse than what we had before this was published... which is nothing... or texts like the RSV or the NRSV." NOTHING?! I just don't get that." Me: OK, what else is there that provides the average Orthodox laymen with the complete Orthodox canon of Scripture, and a translation of the text that the Church holds to be authoritative? Fr John: You've simply restated your argument without taking into consideration either my three points of objection or my conclusion concerning Theodoret's inclusion in the OSB. That others share your reading is a moot point. Yes, Theodoret (reluctantly) condemned his friend Nestorius at the 4th Council. But there can be absolutely no doubt that he was a life-long opponent of St Cyril of Alexandria, even attacking his writing after the latter's death. What precisely in Theodoret's theological legacy is so worth defending? Why precisely are we asked to go soft on him? So he can be included in the OSB? Do you really, honestly believe that the OSB "provides the average Orthodox laymen with the complete Orthodox canon of Scripture, and a translation of the text that the Church holds to be authoritative"? You wrote: "You've simply restated your argument without taking into consideration either my three points of objection or my conclusion concerning Theodoret's inclusion in the OSB. That others share your reading is a moot point." "Let therefore the whole Catholic Church know that justly and irreproachably we have arrived at the conclusions contained in this our constitution. Wherefore we condemn and anathematize Theodore, formerly bishop of Mopsuestia, and his impious writings, together with all other heretics, who (as is manifest) have been condemned and anathematized by the four holy Synods aforesaid, and by the Catholic Church: also the writings of Theodoret which are opposed to the right faith, and are against the Twelve Chapters of St. Cyril, and against the first Council of Ephesus, which were written by him in defence of Theodore and Nestorius." It would have been easy enough to have just condemned Theodoret, or to have condemned all of his writings, but this was clearly not done, and it was no accident that the condemnation was so specific. You often find Theodoret cited favorably. Even on the ROCOR cite, I found a document that referred to him as "Blessed Theodoret" and cited his writings. FC: "Why precisely are we asked to go soft on him? So he can be included in the OSB?" Me: No... so that we can accurately reflect what the Church has said about him and his writings. FC: "Do you really, honestly believe that the OSB "provides the average Orthodox laymen with the complete Orthodox canon of Scripture, and a translation of the text that the Church holds to be authoritative"?" Me: Yes... not perfectly, of course, but a far closer shot than we have seen up until now. The Russian Church approved the use of the KJV of English speakers during the time St. Tikhon was Archbishop of North America. I haven't seen anything in the OSB so far that would lead me to conclude that we have gotten a worse text -- no doubt less beautiful than the KJV, but certainly one that is closer to the text of the Church. The poor Romanian exegetic literature for the Old Testament enriches now with a reference book. This work written by the most prolific ancient Christian interpreter of the Scripture has been very appreciated by the theological personalities as St. Photius the Great who considered it a true standard for the Patristic exegesis of the Book of this Prophet. Format: 13 x 20 cm, 248 p.
"...so that as the Blessed Theodoret says: “do not give yourself even such comfort”." Also, St. Nicodemos speaks of him as "Blessed Theodoret" in the Rudder (p.222 in the English edition). Yes, and the late Metropolitan Laurus, in a speech given not long before his repose, referred to "that great Christian teacher, Origen" (or words to that effect). My own spiritual father has me study Evagrius of Pontus more than any other author on the spiritual life. I've leaned much as well from reading Tertullian and Didymus and Tatian the Blind. However much benefit one may gain from reading such early Christian teachers, one simply cannot afford them the authority of Holy Fathers. I would equally have objected if any of these figures had been included in the list of the OSB's sources. The same goes for Theodoret. His "Historia religiosa" is fairly standard monastic reading; I don't deny that he, like many of the figures I mention above, wrote much worth reading. Nonetheless, however we parse the words of the Fifth Ecumenical Council, the fact remains that they condemned and anathematized significant of Theodoret's writings. As such, his writings have no place being cited as an authority in a book such as the OSB. It's terribly sloppy of the editors, and potentially misleading for the readers, to see Theodoret listed between Theodore of Mopseuestia (a heretic by any standard) and Theophylact of Bulgaria (whose exegetical works are standard and authoritative). You conclude by stating that the OSB represents "a far closer shot" to an authoritative Orthodox Bible "than we have seen up until now." You write: "I haven't seen anything in the OSB so far that would lead me to conclude that we have gotten a worse text -- no doubt less beautiful than the KJV, but certainly one that is closer to the text of the Church." I'd agree, by and large. But that's what I'd call damning with faint praise. 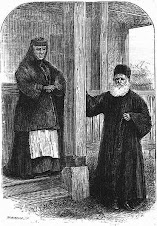 I don't know what Metropolitan Laurus may have said about Origen off the cuff, but that's hardly comparable with him being called "blessed Theodoret" and cited favorably in such standard Orthodox texts as the Rudder, Bulgakov's "Nastolnaya Kniga" , and being praised by a father like St. Photios the Great as an ideal exegete. I think that gives the OSB ample precedent to cite his commentaries authoritatively, so long as they are not from any of his writings which were condemned. As for my faint praise for the OSB, since I have had only limited opportunities to read it up until now, I am praising it only as far as I am comfortable with praising it. That may increase with use. Prior to the OSB, when people asked me to recommend a translation of the Bible, I usually suggested they get their hands on the KJV with the "Apochrypha"... the 3rd Millenium Bible (which is a somewhat revised version of the KJV) being one option. However, if they found the KJV's language too difficult, I recommended the NKJV, because the New Testament text is closest to the text of the Church, and it is a conservative and generally accurate translation. So far I have seen nothing to indicate that the OSB is not a better option. I still hope to see a good traditional English Orthodox Bible at some point. Whatever the flaws of the notes and articles in the OSB, I suspect that they generally are better than nothing too. What I do know for sure though is that a lot of Orthodox Christians are getting copies of the OSB, and are reading the Scriptures, and they have conservative translation that is generally reliable, and when it may be off slightly is no further off than the NKJV was before it, is for the most part for closer to the text of the Church and has the Orthodox Canon of Scripture. In my book, those are all very positive developments. As per Father Whiteford's recommendation on his own blog, I have The New Cambridge Paragraph Bible which is great for New Testament reading. Does anyone have a recommendation for an english translation of the Septuagint? Leaving aside the notes, would the OSB (NKJV sourced), EOB (Brenton sourced), or NETS (NRSV sourced) be the best choice? 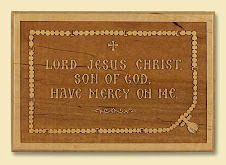 The EOB folks think their work is complementary to the OSB work, since they are revising Brenton's 19th century work and the OSB folks revised the NKJV Old Testament where necessary. Where she followed the lectionary they could have kept the books together. They could have expanded her work into the entire OT. Granted, it would have been a large book, but with thin paper and small type it could have worked. Recommending the NETS in favor of the OSB is straining at a gnat and swallowing a camel. I have just been looking at the first few chapters, and find one horrible translation that distorts the meaning in a fundamental way after another. You may have seen the discussion on the Biblicalia blog regarding the "divine wind" in Genesis 1:2. This is an absolutely heretical translation of that text. "Man" is replaced with with the more gender neutral sounding (but clunky) "humankind". But take a look at Genesis 3:15. The seed of the woman is now just the "offspring". That seriously distorts the meaning of this text. In Greek it is "Spermatos", which has traditionally been translated as "seed" and does not quite mean simply "offspring". Another problem with the NETS is that they alternate between using standard English place and personal names and using odd ball transliterations of the Greek. The name of Eve in English is "Eve" not "Heua", and their first two sons were Cain and Abel not "Kain and Habel". I think if Conciliar Press published a text with weirdism such as the above, they would have been hooted off the stage, but let a group of liberal protestant scholars do it, and we are supposed to stand in awe of their wondrous deeds. No... this text may be worth having on hand for comparison, to see how they translated this or that phrase, but I don't see how it could be recommended to any one as a primary text of the Old Testament. Were this the only English option for the septuagint, I would tell my people to stick to the King James and the New King James. I was of course referring to Genesis 3:16. So Father Whiteford, of the three I mentioned, what would be your recommendation? Or would you recommend something different altogether? My intention is to take the New Cambridge Bible NT and have it privately re-binded/re-bound with a suitable version of the Septuagint for my own private use. I'm not sure what the story is here, but the Brenton LXX has the "seed of the woman" text in Genesis 3:16, rather than the 3:15 as it is in most texts. I would not recommend you mess up your Cambridge Paragraph Bible. It is a good text to have on it's own merits. If you want the entire Orthodox Canon in one volume, the OSB is the only option really. The Brenton text was better than nothing... now the option is Brenton or the OSB. The NETS is simply not suitable for anything other than reference. I heard tell that Holy Transfiguration Monastery might publish an Old Testament text... and if they do, they might be worth considering... particularly for liturgical purposes. I hear that Etna may also publish something. The advantage will be that they will use traditional English. The disadvantage will likely by that they will use Greeky names like Eliseus and Ezekias (as we read today in the Prophecy of Isaiah). Patriarch Pavle of Serbia: Many Years! The Gentle Breeze of Scripture. Paris School: Myth or Reality?